“Honoo no Sogekisha” translates to “Flame Sniper” which also appears in English in parentheses following the Japanese kanji – see CD-single cover. A red flash of light! A red burst of passion! Flames… Swirling pieces of gold, creating a red wind. Taking in war and even the future, my incarnation continues to dance. I am Sailor Mars. I am the soldier of war, and I carry the protection of the planet of fire, Mars. Inside my mirror of flame, I can even see today. You, losing a bit of cheer. Don’t just smolder. I, Hino Rei-sama, will share with you the charm of the flames of Mars. What do you pray for? Achievement in school? Achievement in love? Find bigger, bigger things. Hurry and make bigger dreams. Keep trying with all your might. Make the flames in your eyes shine. Phobos, Deimos, you help out too. It’s all right. Believe it. My inspiration, intuition, and purification will work better than anything. Burn the flames in your eyes, and the flames in your heart. For your dreams, for your wonderful future. By myself today at the Hikawa Shrine, I will keep praying for you. Mars Crystal Power, Make Up! Mars Flame Sniper! 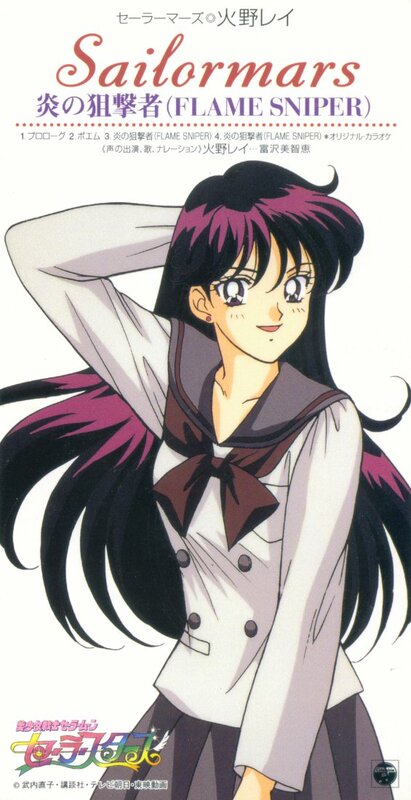 I am the sailor-suited pretty soldier of love and passion, Sailor Mars! Running… Running, running, running, and when I turn the next corner… You should be slowly climbing the same hill road. You’re not here anymore. This morning I didn’t like my hair. I couldn’t tie the ribbon on my chest. The depths of my heart were creaking a bit… I’m not opening up to anybody. The secret of the 27 minutes of only my morning. Spring… When I first laid eyes on you, the figure of your closed-collar uniform from behind was so masculine. In the flower petals dancing like flames, I was always charmed by your gentle eyes. Summer… Your black sunburned arms sticking out from your white shirt were radiant. Winter… When the flowers danced, I picked up the charm dropped from your bag. Without looking up, I handed it to you, and ran away in two seconds. Then in the second spring, in the twilight of the slightly opening flower buds, I first caught sight of you on the same hill road after school. You, giving the second chest button to a cute girl with hair reaching to her shoulders, tied back in a pink ribbon. I guess I’ll graduate without really knowing your name, your voice, or even your face. Like that time, the season will come again when the flower petals dance like flames.